Now that I am an aspiring spinner, I need to really understand wool. It’s properties, how it is processed (or not), and the differences amongst the various sheep breeds. I used to look for wool in the stores, understanding the difference between a highly processed and minimally processed wool, but that was about it—other than the ubiquitous Shetland vs. Merino. So, as my husband aptly predicted, this new hobby would spur its own collection. So, this is the book that I purchased last week to start to understand the complexities of wool and the different sheep breeds. The book first explains in great detail what wool is, the anatomy of the fibers, and how superwash wool is made. Then it discusses turning wool into fibers. The most exciting chapter for me (and my husband, the future sheep farmer) is the “Meet the Breeds” section, highlighting the pertinent facts of 37 different breeds. Lastly is a section on blending wool with other fibers. The back 1/2 of the book is taken up with patterns using wool (although most could be made with virtually any yarn). None of the patterns wowed me, and I wish that she had just kept to the topic of wool, and more detail there. Not a book that anyone would ever purchase for the patterns, and I think that it took the focus away from the main subject. The author is not a sheep owner, and I would be curious to see the reviews from those who raise sheep and have a first-hand knowledge of the product and process. 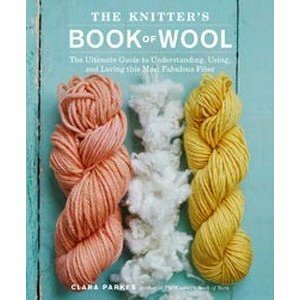 Clara Parker did write an earlier book The Knitter’s Book of Yarn. That one can wait for my Christmas list, but it is one I would also like to own. Just stopping by to say “hello” and Happy Birthday. I came over from Ravelry to wish you a Happy Birthday! I liked your Barbie outfits. I like the fitted top in the previous post. Will you be putting the pattern on your blog? I will try to rewrite the pattern–might take me a bit of time.